Easy To Clean - Filter Basket and water tank removable and dishwasher safe. 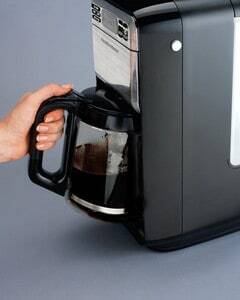 The sleek and stylish Hamilton Beach 46201 coffee maker is great for people who appreciate the pleasures of life. Clearly arranged buttons and a large display ensure the operation of the coffee machine to become second nature quite quickly. If you just want to prepare great coffee with minimal effort and for a low price, this machine is the right choice. The Hamilton Beach 46021 may look familiar to you. That’s because its stainless steel front and black plastic body are typical for the Hamilton Beach style. With 16 inches, it is not a very small appliance, however, it still fits neatly under the cabinets that are usually mounted at a height of 18 inches. Another feature I like is the swing-out brew basket, as this eliminates the problem which you would have with a top-fill machine and the tight countertop space. You are probably still required though to force the machine out of its hiding place once the removable water tank ran dry. Although the buttons feel cheap when pressed they are organized well and are easy to read. Both the On/Off button and the Program button are equipped with an LED-light to indicate an active program or if the machine is running. The bluish laminated display provides the current time, brew strength and thermometer icon for the ‘Keep Warm’ feature. The units on the water tank and the carafe are big enough and easy to read. Brewing coffee with the Hamilton Beach 46201 is really simple since it operates exactly like any other traditional drip machine. 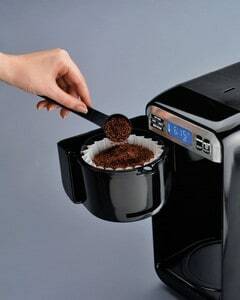 To have access to the filter basket you push the ‘Swivel Filter Basket Button’ on the right side of the machine and fill it up with an appropriate amount of coffee grounds. The water reservoir is removable for easy refilling in the sink. If no cabinets are blocking the top lid from opening, you can also refill the water without removing the tank. Don’t forget to order the o﻿ptionally ﻿available water filter if you don’t have a water softener in your house. This will remove the odd flavor you have when there is a high amount of chlorine in the water. The ‘Brew Option’ feature allows you to increase the strength of the coffee. Using this option will increase the length of the brewing cycle which results in a stronger coffee. Alternatively you can select the’ 1-4 cup’ setting for smaller batches. And if you can’t wait for your first cup before the brew cycle is finished, no problem. Just pull the carafe out and the flow will automatically stop. Just bear in mind that your coffee could be too strong at this time. The Hamilton Beach 46021 is easily refillable in your sink thanks to the removable water reservoir. Since this is a regular drip coffee maker, you have the choice of pre-ground coffee or whole beans, for which you need an additional grinder. Remember that pre-ground coffee gets stale pretty quickly so freshly ground coffee beans are to be preferred for any kind of coffee machine. 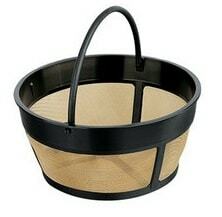 Included is a basic filter basket for which you need an extra paper filter. You should look for filters that indicate 8-12 cups. If you are concerned about the environment you may consider purchasing the optionally available Hamilton Beach Permanent Gold Tone Fi﻿﻿lter now at Amazon. It is important for the flavor of the coffee to be brewed with the correct temperature. According to the NCAA (National Coffee Association), your brewer should maintain a water temperature between 195 – 205 degrees Fahrenheit for optimal extraction. 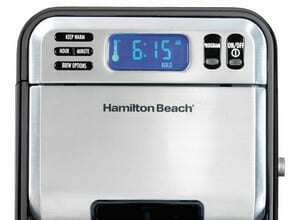 A leading consumer research magazine stated that the Hamilton Beach 46201 failed to achieve the recommended temperature. These results are supported by some customer comments, which felt that the coffee was partly not hot enough. Colder water results in under extracted coffee which leads to a boring flavor. If you're not a coffee aficionado you probably won't taste a huge difference. But don't tell me afterwards I haven't warned you! A selling point is certainly how easy the coffee machine is to clean. I am pleased to tell you that keeping this machine neat is a breeze. Thanks to the removable water reservoir and coffee filter holder you can easily wash them off in the sink or just throw them in the dishwasher. I want to add a minor setback. When you look closely at the picture of the glass carafe you can see the plastic ring at the top. Coffee residues may be hard to remove in the tiny gaps where the plastic ring and the glass pot are glued together. But with all the advantages in mind, this should be a forgivable small issue. Will you be able to satisfy coffee connoisseurs with the Hamilton Beach 46201? Probably not! However, this coffee machine still brews a solid cup of Joe. And I believe that it is hard to find many drip coffee makers with the same or more features in this price category. So can I recommend it? If you are looking for an inexpensive, foolproof coffee maker with above average features, absolutely!